Bodie State Historic Park is a famously picturesque ghost town in a profoundly isolated part of California. Nearby to this park lies two desert peaks which see far less visitors. On my recent ramble through the Eastern Sierras I finally made it to the Bodie Mountains and its most famous town of Bodie State Historic Park. Its difficult to overstate just how far off the beaten track the former town of Bodie lies. At 8,300 in one of the most arid regions of the continent, the surrounding terrain is rough and mostly devoid of any vegetation higher than your knees. Looking around, one might mistake it for a mining colony on Mars or the Moon. Of course, the lure of gold overcame anyone's reservations about living in this otherwise unforgiving climate. Profitable mining dried up long before I came here but the area still draws thousands wishing to visit the near-perfect Ghost Town that remains. Cocooned by extremely cold and dry weather, Bodie looks fairly functional even a hundred years after any real mining occurred. Despite the crowds, Bodie State Historic Park intrigued me enough to visit but I was also searching for some remote mountains to climb. Bodie and Potato Peaks form the saddlebacked high point of the Bodie Mountains located on the boundary of California and Nevada. This is part of the Great Basin and Range where hundreds of other similar mountain ranges run between California and Utah. 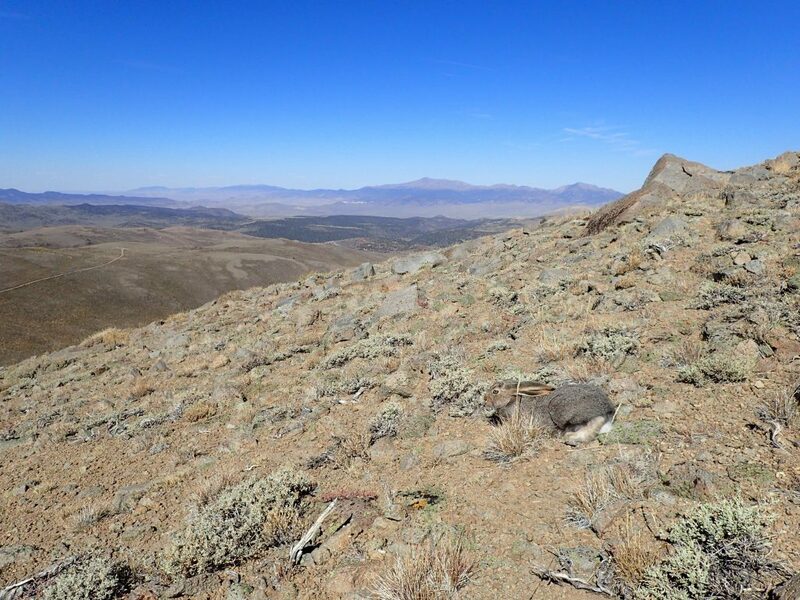 Taller summits that are further away from the Sierras are quite lush and known as "Sky Islands" of biodiversity. For the Bodie Mountains, the proximity to the Sierra Nevada Crest mostly inhibits moisture and creates this stark landscape. Also adding to their bareness is the probable logging of any available trees in the area to create local towns. Ranching persists at these altitudes as well. 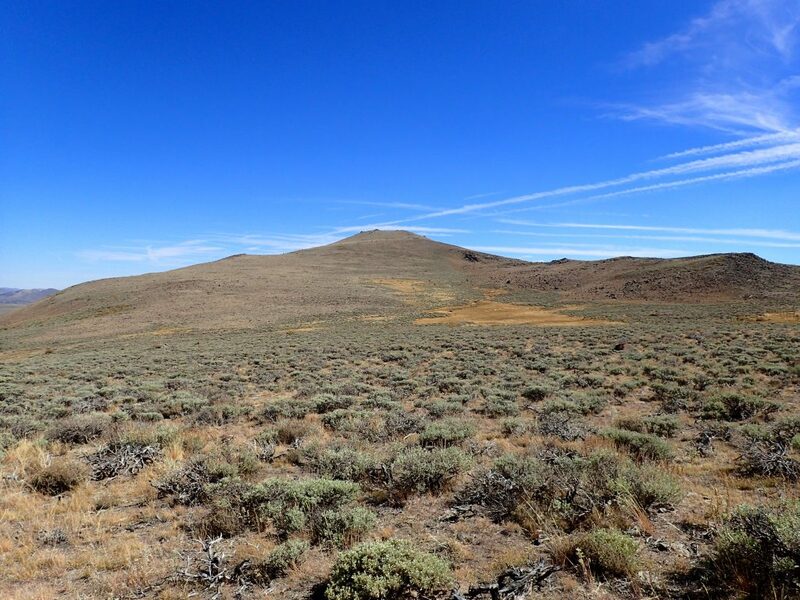 Other Options- The Bodie-Masonic Road crosses the higher altitudes of the range and connects the town of Bodie with the town of Bridgeport. This is a dirt highway and its rough in some sections but easily crossed by prepared people in 4x4 vehicles. Aurora Canyon Road is more direct than Bodie Masonic Road from Bridgeport and I saw somebody clear it in a normal-clearance Hyundai but they didn't recommend it! From my makeshift parking area, both Bodie Mountain and Potato Peak are plainly visible and route finding is easy. I chose to cross the road and follow the unmaintained dirt road almost to the saddle between the two mountains. This road is not a straight shot to the summit but it cuts down on the time otherwise spent bushwhacking. I came within about 400 vertical feet of the summit before I went off trail. The summit remained in view the entire time and though the going was steep, it was easy. Towards the very top there are a few scrambling sections where hiking poles made the going easier. After about an hour and a half of climbing I stood on the summit. People who are less inclined to take hundreds of photos will make it up faster! Despite the easy of climbing, the summit register had less than two dozen signatures from this calendar year. Nearly every one of them was from another peakbagger like myself, meticulously ticking mountains off their lists. I signed it and appreciated the solitude. A few landmarks from the summit worth pointing out: To the West, the jagged crest of the Sierras rises prominently. Mt Patterson and the Sweetwater Range lie to the North and unlike the Sierras this is a volcanic range formed from the Walker Caldera. Mono Lake looks like a small sea in the South. Finally, the prominent ridgeline of the Wassuk Range rises across the valley to the east, culminating with the pyramid-like Mt Grant. Only clouds could obstruct this otherwise panoramic views. 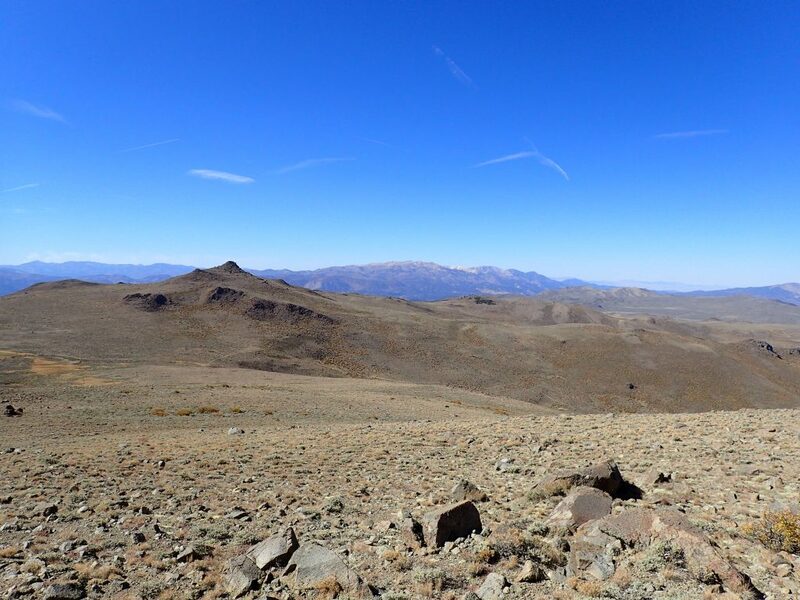 From the summit of Potato Peak, its a brief descent to the saddle then a bushwhack to the summit of Bodie Mountain. 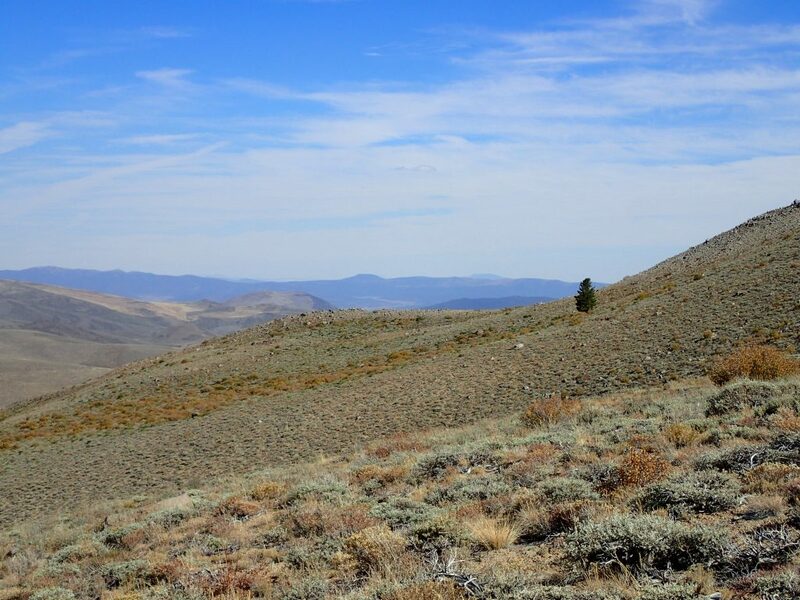 The saddle is at a rough altitude of 9,800' so its a ~300 foot climb to Bodie. They're separated by about half a mile. That's not so bad for bagging another great summit! 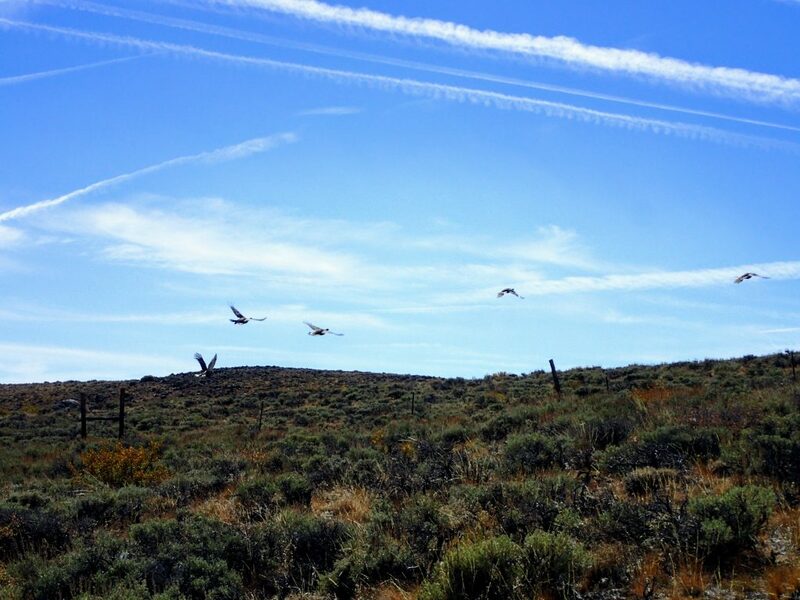 My favorite part of the hike was the saddle where I saw two endangered bird species back to back. The first was a flock of about 20 Sage-Grouses who were perfectly camouflaged until the moment I accidentally startled them. These grouses have one of the most impressive mating rituals of any bird species but obviously in the late fall they had other things on their minds. I hope to someday witness their "lek" courtships. I couldn't snap a good photo of them but I saw a pair of Pinyon Jays while crossing the saddle as well. 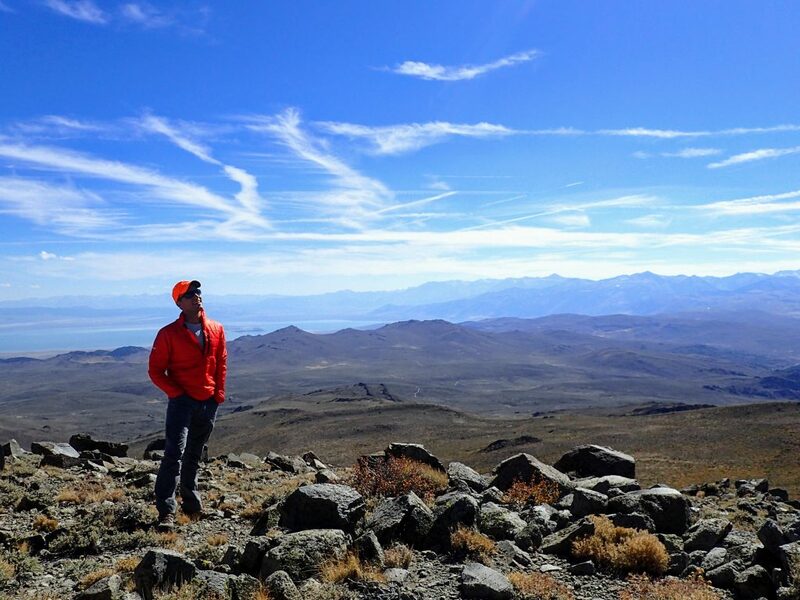 Bodie Mountain had much better views of Mono Lake from its broad summit. I counted three rock piles that all seemed like highpoints but on the "eastern" rock pile I found the summit register. I think there were 8 names on in for the calendar year. Many more probably visit and either never find or simply don't sign the register. But I felt a sense of accomplishment given its clear isolation. All in all, the hike was less than 5 miles and involved about 1,000 feet of elevation gain. It is a surprisingly easy hike considering the rest of the summits in the area. Plus, there's the added benefit of seeing Bodie State Historic Park but don't expect the solitude of the mountains! If you're in the area, I recommend this hike.